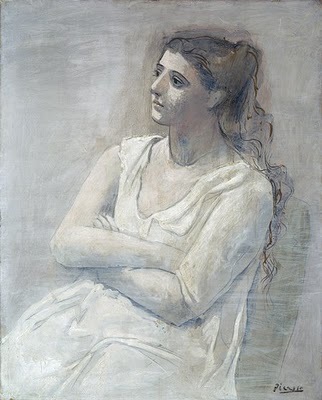 As it gears up for its next blockbuster—Picasso in the Metropolitan Museum of Art, April 27-August 1, 2010—the Met is whetting our appetites with two delectable charmers. 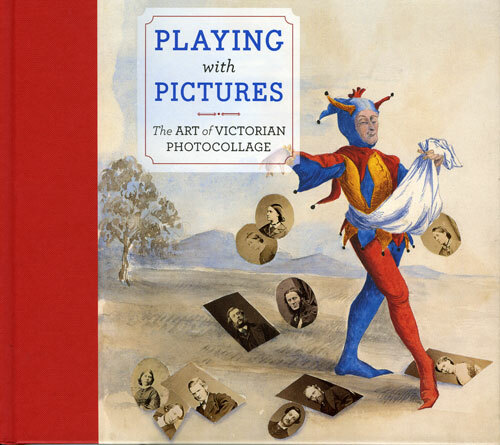 The first, Playing with Pictures:The Art of Victorian Photocollage, tips its fanciful hats to the well-bred 19th-century women who weren’t yet allowed to express themselves in oil or stone. 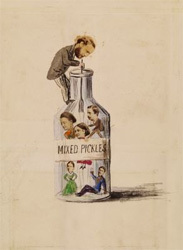 So they cut up photographs and added them to their own watercolors, or to existing prints, to give some hints (mostly clever and often very funny) of what they were thinking. The works beguile and hint at some very lively subtexts; Freud would have loved them. 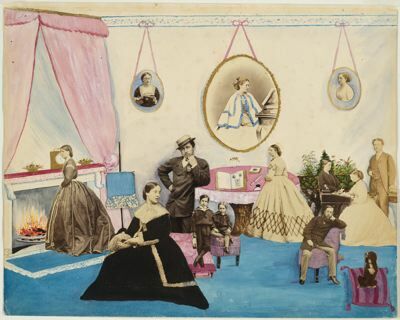 Until May 9, along with two papermaking and photocollage workshops for teens, April 17 and 24, to let you revisit the Victorian sensibility, hands-on. Hard to know what today’s Tweet sixteens will make of the opportunity (sort of hustle meets bustle), but miss it at your peril. 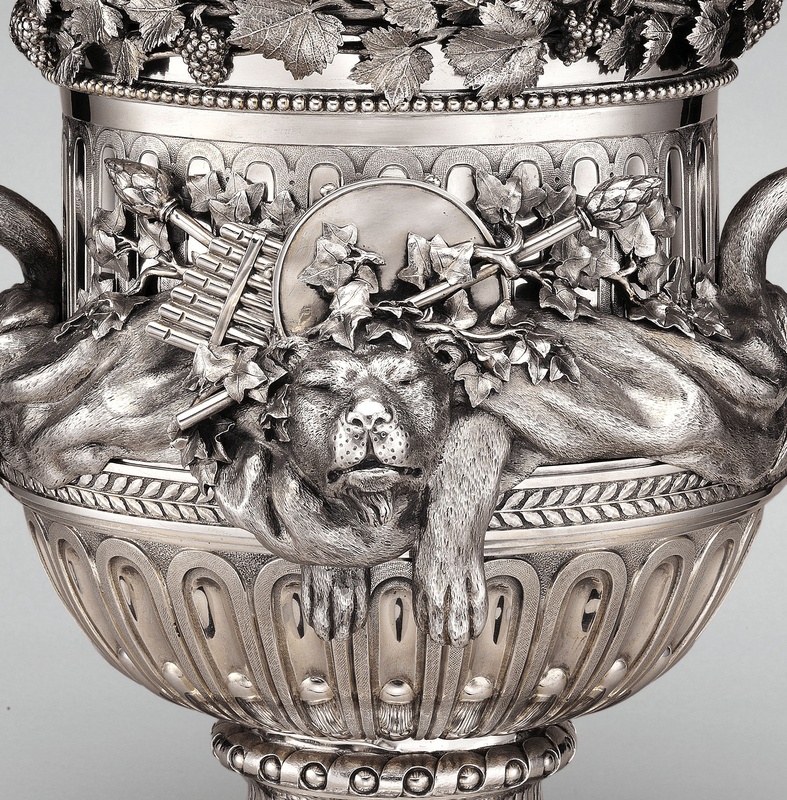 The second jewel is Vienna, Circa 1780: An Imperial Silver Service Rediscovered. The museum has apparently designated the vestibule to the Sackler Wing as a kind of permanent homage to the Hapsburg empire and its satellites. 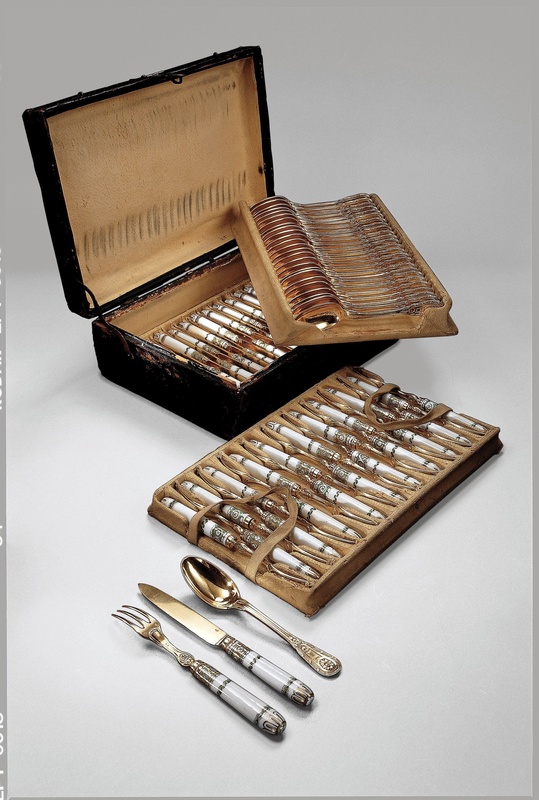 In place of the recent exquisite porcelain dessert service once owned by Marie Antoinette (see High/Low: Moveable Feats, November 7), you will find a staggering silver service once used by Marie’s sister and brother-in-law: Marie-Christine and her husband, Albert Casimir of Sachsen. Most of it was made by Ignatz Joseph Würth, Imperial court master of heavy metal (one tureen and tray alone weigh 27 lbs.). 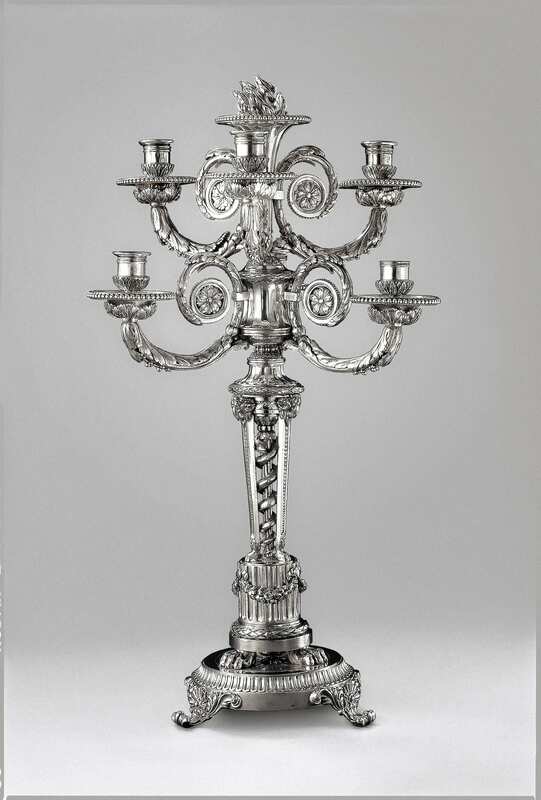 The 350-piece service (for 36, or perhaps even 48) included individual candelabra, 24 dozen service plates, utensils, vessels, etc., and was a gift from the girls’ parents, Empress Marie Therèse and her husband, to be used in the Duke’s diplomatic entertainments. There are examples of origami-like folded linen napkins that wiped imperial lips, and seating plans for the A-list diners. Even in those gilded times, it must have knocked their silk knee socks off! A discreet wall panel hints at some backstage intrigue: sold at auction by the Duke’s distant heirs after World War II, the service was reported “lost” in 1985. The Met marshalled its resources (and information network) to locate most of it, and acquired it around 2002. For those of you who watch Antiques Roadshow, there are even piles of the original boxes! (You know what that means…) Take a magnifying glass—the better to appreciate the brilliant sculpted and incised silvery details—and take your time. Vienna, Circa 1780 runs until November 7. The Met’s Petrie Court café will be serving Viennese goodies for the duration. P.S. 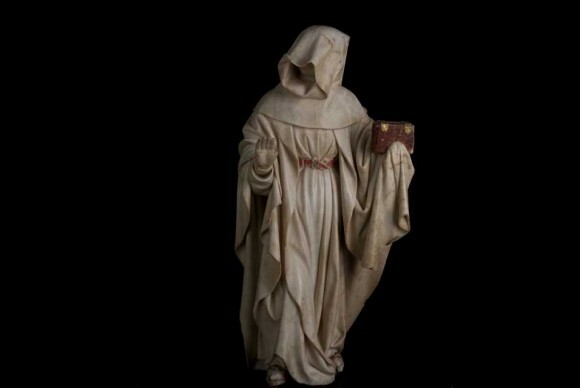 On your way to the silver, don’t miss the procession of 37 pint-size alabaster mourners in the Medieval Hall, on loan from the Musee des Beaux-Arts in Dijon. They may be 500 years old but, as they reenact the funeral of Jean the Fearless, Second Duke of Burgundy, they express, in face, figure, and gesture (and in the graceful drapery of their habits), sorrow of such immediacy that we recognize and share it in the here-and-now (until May 23). 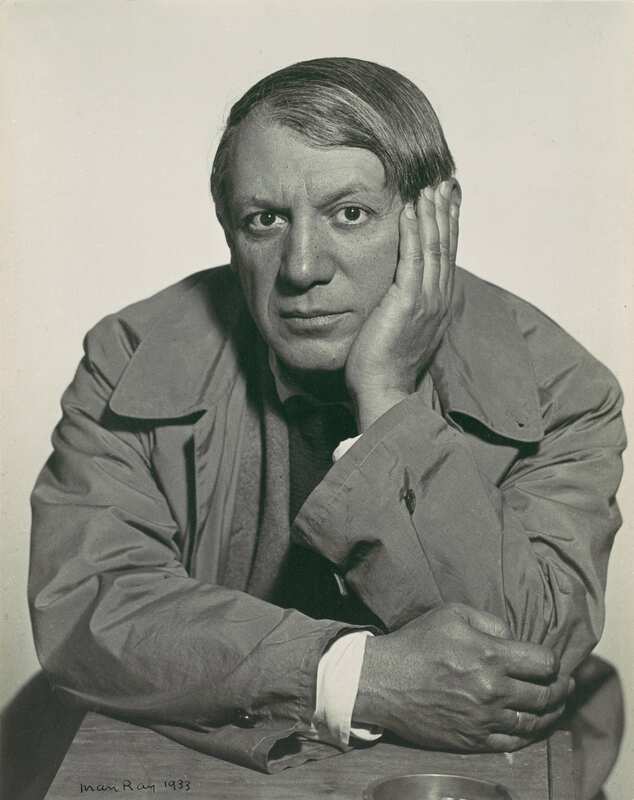 Pablo Picasso is having is having his day, again. Or, to be precise, his venues. At the Metropolitan, until August 1, you can see what can be described as the tip of their own iceberg: over 300 objects from their collection of hundreds more. No loans! It’s a big, big show that reveals how the artist got from here to there, and beyond: a hotbed of paintings, drawings, sculptures, ceramics, and prints. 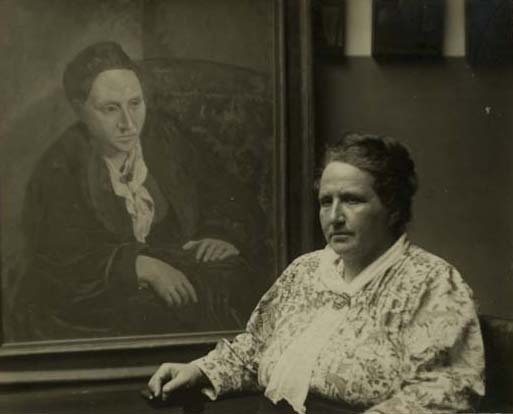 Plus—for those who relish iconic images–both the oil portrait of Gertrude Stein (a bequest to the Met by the subject after her death in 1946) and the dreamy Woman in White (acquired by the Met from MoMA in 1951). Take it easy; then take a bus downtown to MoMA until August 31 to see Picasso: Theme and Variations–100 prints that tell the same story of restless exploration, statement, and moving on. It was what Picasso did. Because he expresses not only the momentum of the 20th century, but the perpetual motion of our own, his journey will always be on view. The only thing to do when you’ve swallowed a huge, addictive meal is to look for more to eat. 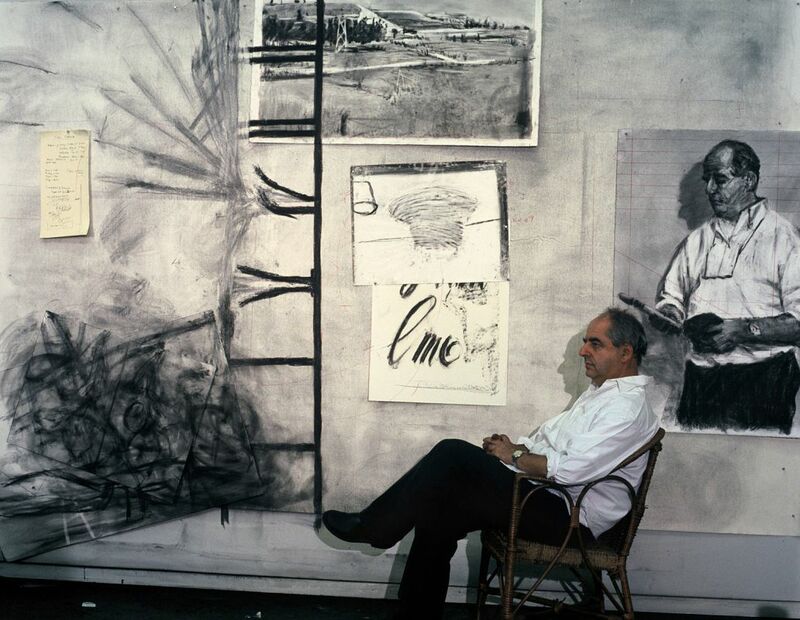 In the case of William Kentridge (currently New York’s man of the moment), it’s not hard to find: begin with MoMA’s huge retrosepective, Five Themes (until May 17), www.moma.org. It’s overwhelming on first encounter, so you know immediately that you’ll have to make a few more trips. 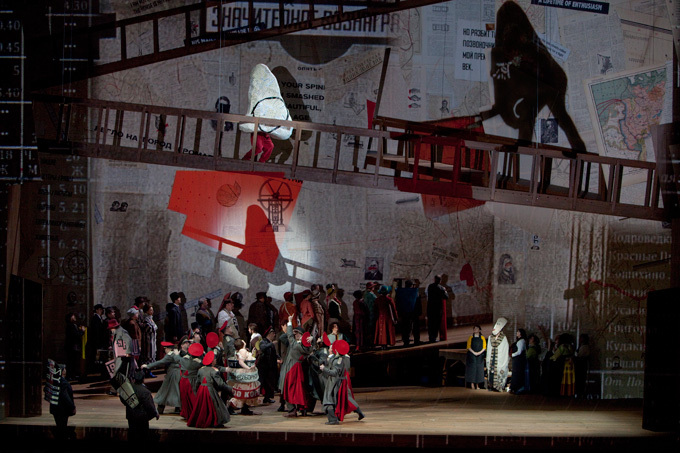 Then there have been the lectures and one-man shows and, at the Metropolitan Opera, the premiere of his new production of Shostakovich’s The Nose (décor and direction). Having seen but little of Kentridge’s work previously, total immersion in thirty years of its scope and substance was, in fact, thrilling. To begin with, he’s fast on the draw; his high-speed charcoal sketches (many of them at MoMA) reveal technical craftsmanship, as well as his attitudes toward the body and its place in the world. 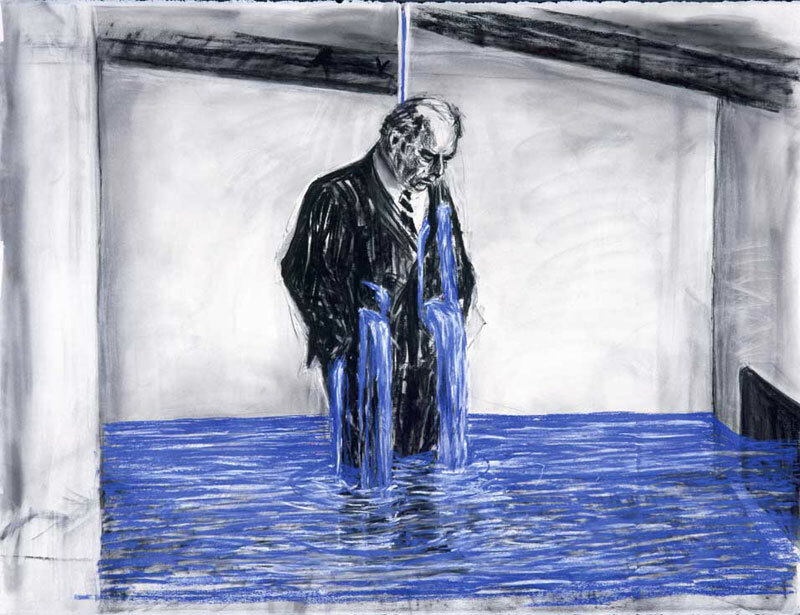 Although most of the drawings are of Kentridge’s own increasingly portly self, they display none of the narcissism that marks the work of so many high-profile artists. 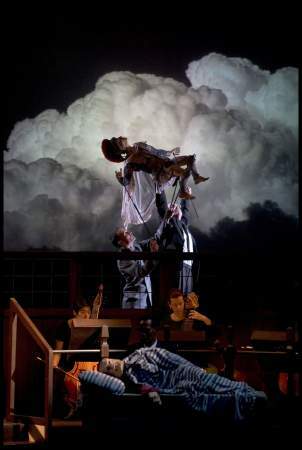 Often combined with rough torn-paper figures that inhabit many of his animated videos and the music they move to (Kentridge has an unerring instinct for just the right notes, choosing everything from African chant to Mozart), they are notable for the degree of visceral response they provoke. At MoMA, there are five darkened rooms: in each one, a different video and ancillary material project what’s on the artist’s mind. The earliest is Ubu Tells the Truth, clearly a comment on South African society. But don’t think it’s all dark and dreary. Much of the time, Kentridge’s tongue remains firmly in his cheek. Many of his collages include printed material on which he’s painted or pasted additional layers of commentary and meaning; they can be sly or thigh-slapping, but always express a deep generosity of spirit. 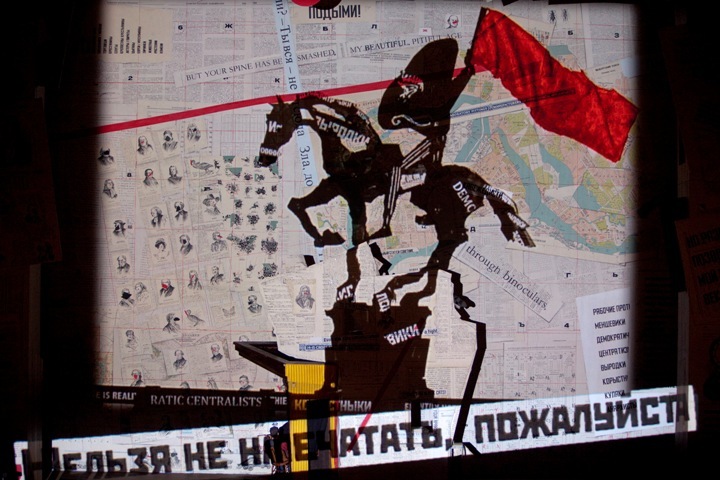 Kentridge is South African, and a long-time foe of apartheid; his videos reflect his convictions. Dressing for most occasions in an open-throated plain white shirt and pants, he lives very much in his own time and place, reinventing the concept of Renaissance man. He has studied mime, acting, worked with puppets, and directed and designed plays and operas (Monteverdi’s The Return of Ulysses and Mozart’s The Magic Flute, before The Nose). Kentridge comes from a family of lawyers, and was expected to hold his own during dinner-table conversation at home. It honed his skills for “arriving at an opinion that was notoriously subject to cross-examination.” (His father, Sir Sydney, a noted jurist, led the inquest into the death of Steven Biko; he was in the audience, beaming, when Kentridge spoke at the NYPL.) 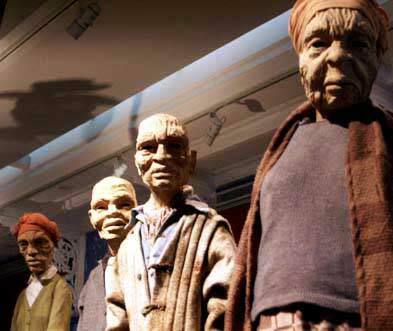 And the artist still lives, with his family, in the house in which he grew up outside Johannesburg. Unlike many traveling icons of art, he remains rooted in his own culture, yet moves easily through other cultures and times. There is always a center to his sophistication and complexity. And a heart. 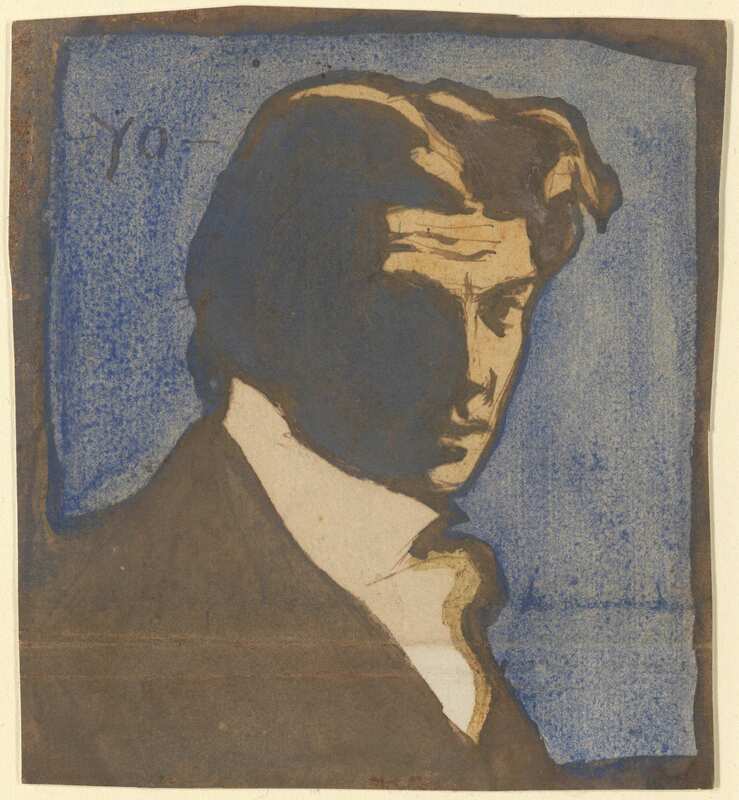 At Live from NYPL, Kenetridge described coming to New York in the 1980s with his portfolio and being roundly turned down because, he says, “I was a white South African; because I was a figurative artist; because I didn’t (then) paint in oils; because I didn’t live in New York.” He also claims to have become an artist because he had earlier “failed at making enamel jewelry; at being an actor; at painting in oils; and at film.” So he went back to the studio and started drawing. “When I was 30, I could finally write ‘artist’ instead of ‘technician’ after my name. I am a dilettante—an amateur—but that’s what I need to be. I delight in what I do.” He sees in opera a validation of his protean skills and, in The Nose, an allegory of South Africa—its hierarchies and absurdities, the rigor of its crazy logic. 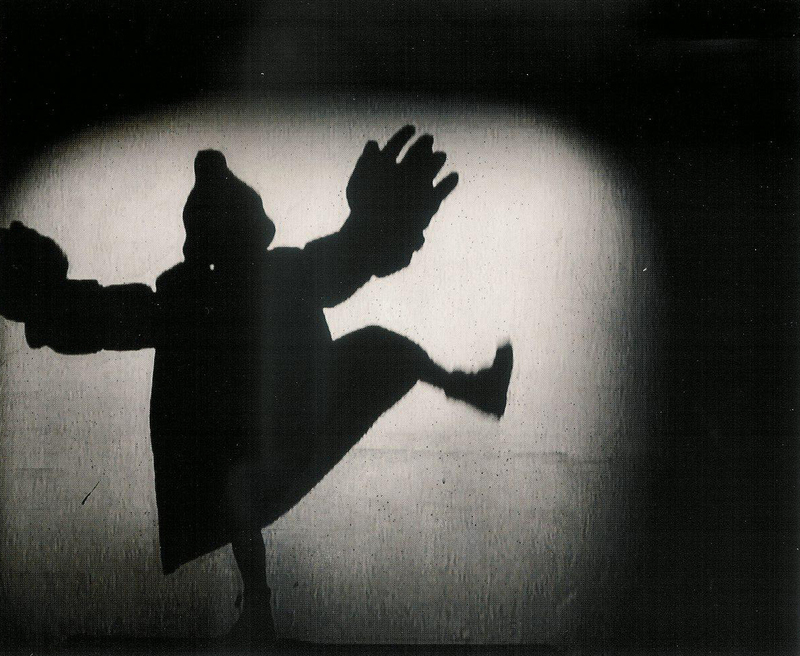 He is a fan of commedia, who can demonstrates his mime and timing skills with seven ways of walking. 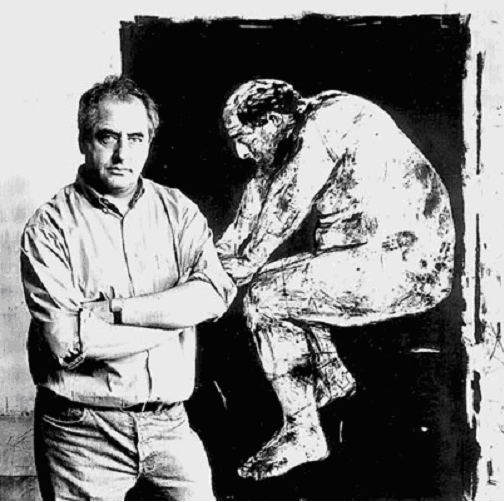 The last thing (like the first) to say about William Kentridge is to repeat that, even with the MoMA show, the lectures, and The Nose, I was left wanting more—much more. 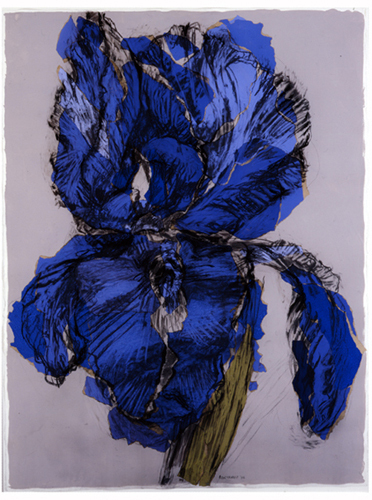 Since Kentridge is notoriously prolific, I’m likely to get my wish. The MoMA show has already toured the United States, and will be on the road until 2012 in Paris, Vienna, Jerusalem, Amsterdam, Vancouver, and Melbourne. You can also try catching him at work in Italy, for the duration of his Prix de Rome Lichtenstein Residency. Meantime, you can hit the computer for a virtual Kentridgean feast: kick back and enjoy the entire Live From NYPL evening. You’ll come to love those plain white shirts (okay, he probably has closetsfull) and plain dark pants. 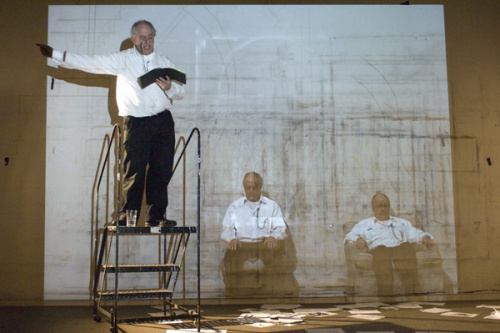 But God is in the details–in what Kentridge says, how well he says it, and his repertoire of moves. It’s a wonder! See it for yourself, and enjoy Another Kheppi Ending. Live From NYPL is always a privilege to experience; tickets are hard to come by. But if you can’t be in the house, the library does us the favor of streaming the events. Watch them, and be thankful!